Francis Oite of St. Mary's Kitende (yellow) challenges Barding players. Barding are the new champions. St. John's Kaloleni's Jackline Baya is challenged by Remera's Florence Mukeshimana in the final which Ramera won. “Mission accomplished.” These is how John Odinga, the captain of Barding Boys summarized the team's fairy tale after lifting the East Africa Secondary Schools Sports Association football title at played Kipchoge Keino stadium in Eldoret. James Ochieng scored the lone goal that saw Barding Boys win the title breaking a 14-year old drought by any Kenyan team. 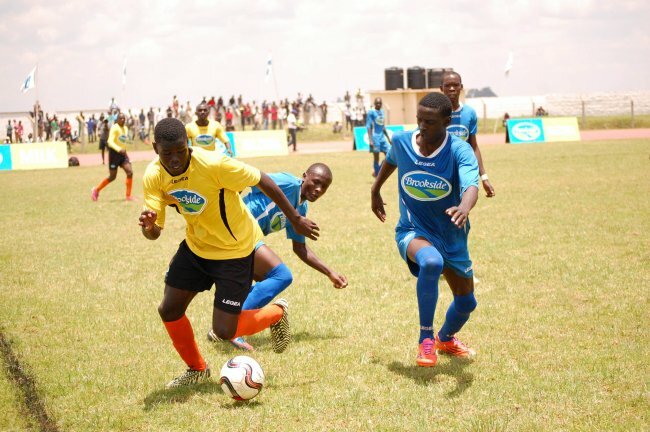 The national and regional debutants finished the championships without conceding any goal on their way to the historic win over former champions Kitende from Uganda. Ochieng, a form two student collected a low pass from Ziko Kombo, beat two players from the centre line to the left corner before crossing in the six-yard box and scoring the goal in the 70th minute. The win was a great achievement for football Kenyan team and a solace after another debutant St. John’s Kaloleni Girls lost the football final to Rwanda's side GS Remera on penalties. After the boy's final, Odinga stated their mission was to win the trophy, a mission accomplished. “We have achieved what we came to do here. We wanted to win the trophy but have a heavy task ahead since we have to work hard and defend our next year title,” said Oginga. The Lake region school head coach George Owoko said he used the skills that he once obtained while learning at Kitende years back. The former Tusker FC tactician said losing the national title to Laiser Hill in Kisumu was due to a technical error. “The boys played according to laid down instructions and God answered our prayers,” said Owoko. In the girl's category, Rwanda's GS Remera beat Kenya champions St John's Kaloleni 5-4 on post-match penalties in after a 1-1 draw in normal and extra time. The loss was painful for their captain Mwanahalima Adams, who turns out for national team Harambee Starlest who missed to convert a determining penalty when St. John's Kaloleni goalkeeper Margaret Nzoro had saved Florence Mkeshimana penalty. Karisa Mwanaidi, Purity Karembo, Mwagongo Nuru and Halima Nuru scored their spot kicks for Kaloleni. Adams shot went wide while Gwendo Esther's kick was saved as the Kenyan side missed two in six attempts. GS Remera scored through Callixte Iradukunda, Amothe Mukeshimana, Jackline Umumarakunzi, Janette Mukeshimana and Agathe Irikumidiwe. After a goalless first half, GS Remera's striker Mukeshimana broke the deadlock in the 60th minute. Adams "Dogo" replied for the Kenyan champions 10 minutes later. Adams scored after she was yellow carded for fouling a GS Remera defender. Adams picked the ball after it was thrown up in fair play. She dribbled past GS Remera's strikers beore scoring to send the stadium in a frenzy, an answer to the yellow card. GS Remera captain Iradukunda said they have been fighting to win the title for a long time. She said the team almost lost hope when they were eliminated in the semifinals at their backyard last year. Coach Bonny Nsengimana said: "Our team is currently in their happiest moment today. At least we travelled far to win the get trophy. We had our strategy for two players to man the Kaloleni captain. We knew she is the engine of the team and we had to stop her." The coach and the captain, however, appreciated that St John's Kaloleni is a strong team. St John's Kaloleni beat the new champs GS Remera 2-1 in the opening match of the pool stage last Sunday. GS Remera play in Rwanda's Middle Division League. Wiyeta Girls from Kenya finished third after flooring Uganda's Masaka in the playoff. In boy's volleyball final, former title winners Malava from Kenya outsmarted Rwandan side Apapen 3-0 (25-16, 25-20, 25-18). Malava defeated national champions Cheptil in the semifinal while Apapen beat defending champions Rusumo from Rwanda.